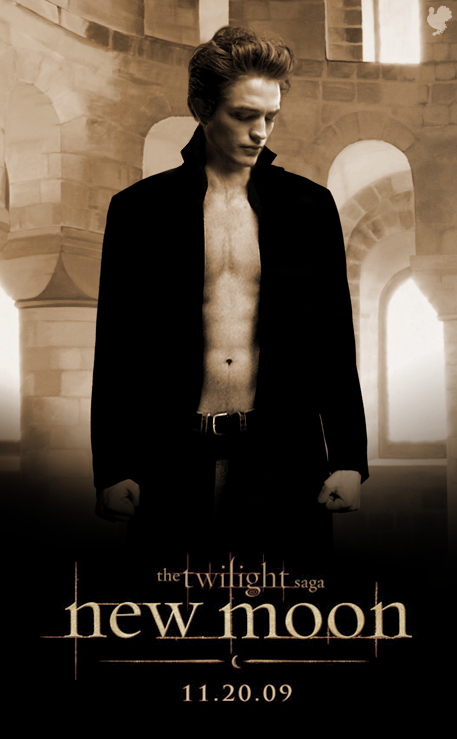 The pale, sunken creepiness that is Twilight teenage crush du jour, Edward Cullen. Albeit one I wasn’t sure I actually wanted. But a very good (and very, very cool) friend invited me to come along. It turns out someone we knew bought about 20 tickets to the midnight showing over a month ago, and there it was. Ultimately, you, dear readers, tipped the balance. I wanted to bring you “news from the front lines,” so to speak. First of all, you need to understand that there were people (young female people, accompanied perhaps by an occasional, ill-fortuned boyfriend, husband or father) camping outside theaters as early as last Monday. Yes, Monday. Four days before opening night. If this makes you feel ill, good. If not, then you’re probably one of George Lucas’s mindless acolytes, but that’s a rant for another day. I must confess there was one thing I found myself enthusiastically anticipating as I walked into the theater (to take my seat on the front row by my good friends, a.k.a. moral support): Dakota Fanning, the delightful little actress that helped me survive the atrocities of Push. Cool, right? After about 8 previews (or more — I lost count), the title of the film graced the screen — a full moon waning slowly but completely to reveal… you guessed it: “New Moon.” I experienced, at this moment, a faint glimmer of hope. It did not last long. I won’t give you a synopsis. You know how it starts, you know how it ends. And if you don’t, I swear to you it does not matter. It’s about a love triangle between a whining cipher of a girl, an emaciated-looking vampire, and a werewolf with muscles that make guys like me want to cry. There was so much that was painfully bad about the latest installment in this franchise that it seems almost pointless to continue. But I will. For you. I was most mesmerized by the fact that the entire narrative maintained a single, nearly unbroken emotional tone: romantic teenage angst. Every moment was agonizingly meaningful, and every scene was staged in oppressively close-quarters. The sheer number and density of close-ups triggered within me a near-panic state of claustrophobia. This may have also had something to do with the pacing. I was practically (literally, in a few instances) yelling for each scene to end. The dramatic pauses were so many and so long that I often forgot what the characters were talking about. Not that anything they said was important or interesting. The writing was bad bad bad bad bad — so unrelentingly, absurdly terrible that the two or three lines that achieved mediocrity struck me as profound, invigorating genius. I can’t in good faith condemn the acting, because both the writing and directing (pacing, tone, etc.) were so excruciating. What did these poor young stars have to work with? It would be like faulting someone for failing to prepare a healthy meal after providing them with nothing but a sack of human excrement and a shovel. What are they going to do? As for Bella (played by Kristen Stewart), every moment was sadness, despair or anguish, the last of which was consistently punctuated by what looked remarkably like nausea. I don’t have words to describe how thrilled I would have been if she would have actually blown chunks just once. After all, the audience ought to be able to achieve vicarious catharsis through the protagonist. And I really, really wanted to throw up. Jordan Petersen is a film correspondent for Rhombus and, it is safe to say, not a Twilight fan.